Russia’s light arms industry presented its most innovative development in recent years, the SVLK-14S Sumrak, the world’s first sniper rifle that can hit a target four kilometers (2.4 miles) away. In the town of Tarusa, a two-hour drive outside of Moscow, stands a small one-story building with the sign “Tsar Pushka” (Tsar Cannon). At first glance the building seems plain and uninteresting. Inside, however, is a factory that produces some of the world’s most powerful sniper rifles. This is the first private factory in Russia to produce weapons. Vlad Lobaev, the owner of Lobaev Arms and its principal gunsmith, studied the art of gun manufacturing not in his motherland, but in the U.S., where he spent several million dollars to buy equipment for his factory. It is used with the .408 CheyTac bullet (10.36x77mm), which exits the barrel at a speed of 900 meters per second. The factory’s most powerful weapon is the SVLK-14S, which due to its power was nicknamed Sumrak (twilight). “This weapon was made piece by piece, just like a Ferrari or Porsche, for people who appreciate high-precision guns, as well as for professional snipers who use them in long-range shooting,” said Sinichkin. “Such a bullet can pierce a rail that is three centimeters thick. Imagine what will happen if this bullet hits the enemy. No bullet-proof vest will help him,” remarked the engineer. Just like a luxury-class car is not intended for every day driving, this weapon is not meant for combat. To increase a shot’s range and accuracy the engineers reduced the “running” part to a minimum after the trigger is pulled, and thus removed the clip. Consequently, what resulted was a single-shot rifle. Another particularity of the Sumrak is its heavy, meter-and-a-half (1430mm) barrel, made out of high-grade aluminum, which can function despite changes in temperature, from -40 to +60 degrees Celsius. It gives the rifle considerable power and weight (9.6 kilograms). “The weapon was designed with two types of muzzle brakes, which reduces recoil to a comfortable level. No rifle of this caliber allows a shooter to take 150-200 shots a day without impacting his health. All this is embodied in the Sumrak rifle. It also has the classical form of a gunstock and is distinguished by its minimalism in the details. There is nothing superfluous; only that which is necessary to obtain maximum range and precision,” added Sinichkin. While you will not be able to run around the woods with this rifle, you will be the first in the world to hit a target 4,200 meters away. Something Russian snipers already did at the end of September. 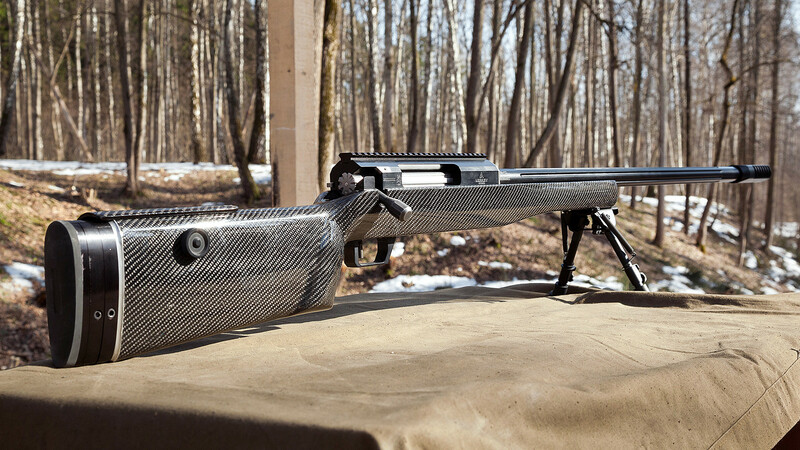 The company also created one of the rifles being used by snipers guarding Vladimir Putin. Let’s see how powerful it is with a Big Guns test.